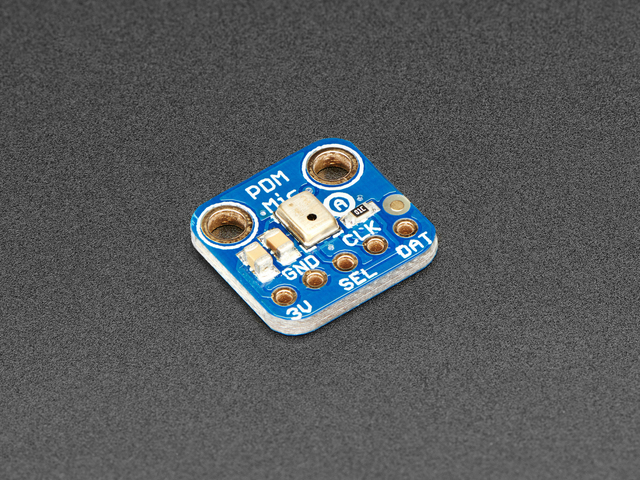 An exotic new microphone has arrived in the Adafruit shop, a PDM MEMS Microphone! PDM is the 'third' kind of microphone you can integrate with electronics, apart from analog or I2S. These microphones are very commonly used in products, but are rarely seen in maker projects. Still, they have some benefits so we thought we'd offer a breakout for the shop. The first thing to note is that this sensor does not provide an 'analog' output like many of our electret microphone assemblies. So it's great for chips that do not have analog inputs. Secondly, the digital interface is a very simplistic pulse density modulation output. It's digital but its not PWM and it's not I2S. You will need to make sure your chip has a PDM interface - most 32-bit processors these days do! PDM is a little like 1-bit PWM. You clock the mic with a 1 MHz - 3 MHz clock rate, and on the data line you'll get a square wave out that syncs with the clock. The data line with be 0 or 1 logic output, with the square wave creating a density that when averaged will result in the analog value out. Either way you decide to go, make sure you have a handle on what support you get with your platform, as these chips are a little tricky! This guide was first published on Jan 10, 2018. It was last updated on Jan 10, 2018. This page (Overview) was last updated on Apr 19, 2019.